INDUSTRY LEADING 2HP FULLY ENGINEERED ELECTRIC HYDRAULIC SYSTEM BENDS OVER 90 DEGREES IN 12 SECONDS! DUAL ADJUSTABLE AUTO ROTATION STOPS ENSURES CONSISTENT BENDS WITHIN A FRACTION OF A DEGREE, EVEN WITH DIFFERENT OPERATORS! EASILY BEND 180-DEGREE “TACO” ROLL CAGE GUSSETS WITH OUR 180 DEGREE PRESS BRAKE! FITS IN A STANDARD 20 TON SHOP PRESS, OR USE OUR SUB-$500 DIES IN YOUR EXISTING PRESS BRAKE. MAKE YOUR DIMPLING PLATE WORK UNIQUE AND GENERATE WORD OF MOUTH! Not sure what these are? H1 is the common military Humvee. These came with a unique 2 piece wheel design that clamps the tire to an internal beadlock/runflat ring that makes the wheels one of the only DOT approved double beadlocks in the world. They are also 16.5″ diameter, which is the smallest wheel you can typically fit on 1 ton axles and Unimog axles. This is a great advantage because you can run a tire with more sidewall for better tire flex and traction. The problem with these H1 wheels is that they are only in one bolt pattern, and the offset is horrible for most applications. Our kit comes with new wheel centers and rock rings to keep the bolts protected and make the wheel rigid. Simply cut out the original wheel center, weld in the new center and rock rings, and you have a custom set of double beadlocks for less than $800 including the cost of the donor wheels in most cases. We do not sell the H1 wheels, only the recentering kits. H1 wheels come in 3 main varieties, 8 bolt, 12 bolt, and 24 bolt. This refers to the number of bolts holding the two wheel halves together (not the number of studs that you mount the wheel to on your axle). The 8 bolts are older, and originally intended for use with bias ply tires. The 12 and 24 bolts are newer and are better for thinner sidewall tires like radials and are rated for higher pressure. They are all VERY tough wheels and are close in weight/strength. Why Buy from Rogue Fabrication? You have probably shopped around and seen the four types of centers. Flat 1/4″ centers bend. Flat 3/8″ centers are very heavy and still bend sometimes. Pressed 1/4″ centers are plenty strong, but limit you to a maximum of only 3″ or 3.5″ of backspacing. That will make your scrub radius very large (bad for steering geometry, knuckle bearings, and tire clearance). Gusseted 1/4″ centers give you strength you can depend on, and the backspacing options you need to make your vehicle safe and maintain drivability. There are actually 5 types of H1 beadlock wheels. This information is more than most of you need, but we had trouble finding it elsewhere, and decided it needed to be easier to find. 8 Bolt H1 wheel: 8 evenly spaced studs hold the halves together. Weighs 32 lbs without the runflat insert. Rated for 30 psi. 8.5 inches between the bead seats. These wheels are strong and lightweight. This slight increase in width over all the later wheels lends itself better to running bias ply tires on the stock runflat insert. The stock runflat insert is a 2 piece magnesium alloy ring. 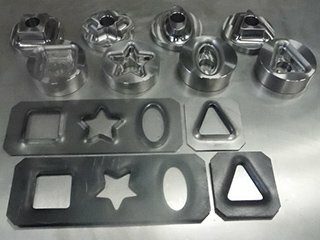 The alloy used is mildly flamable, and can be cut very safely with a reciprocating saw to remove the runflat portion of the rings and leave just the beadlock portion. Once you switch to a fabricated or PVC insert, those width details don’t matter at all. We do not sell inserts of any kind. 12 Bolt (early) H1 wheel: 12 evenly spaced studs hold the halves together. Weighs 38 lbs without the runflat insert. Rated for 45 psi. 8.25 inches between the bead seats. Higher weight capacity then the 8 bolts. Originally supplied with rubber runflat inserts. 12 Bolt (late) H1 wheel: 12 evenly spaced studs hold the halves together. Weighs 38 lbs without the runflat insert. Rated for 45 psi. 8.25 inches between the bead seats. Only difference from early 12 bolt wheels is the shape/curvature of the wheel. You will not likely ever be able to tell the difference. Originally supplied with rubber runflat inserts. 24 Bolt (early) H1 wheel: 24 evenly spaced studs hold the halves together. Weighs 48 lbs without the runflat insert. Rated for 45 psi. 8.25 inches between the bead seats. These are not all that common and offer nearly no advantage over 12 bolt wheels. We do not offer rock rings for them. Originally supplied with rubber runflat inserts. 24 Bolt (late) H1 wheel: 24 studs hold the halves together. They are arranged in 12 pairs of 2. Weighs 48 lbs without the runflat insert. Rated for 60 psi. 8.25 inches between the bead seats. Our 24 bolt rock rings are for these wheels. These are the only E load rated H1 beadlock. They are the best choice if you want to tow or build a rig that is over 4 tons (curb weight). Originally supplied with rubber runflat inserts. Max stress is 381 MPa (above yield for mild steel). We ran all three of our stress simulations with the same physical constraints and load simulations. In this case, our load was a 7000 pound vehicle distributed on 2 wheels, loaded axially (like a rollover, except static). Max stress is 172 MPa (below material yield of 351 MPa). 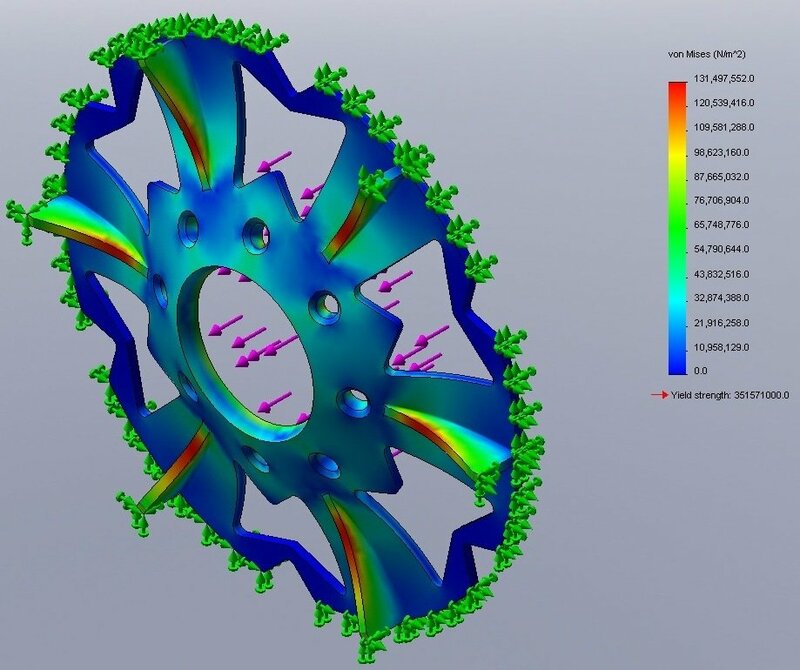 This sample wheel would survive in our test conditions, but they are not a perfect representation of reality. Max stress is 131 MPa (below material yield of 351 MPa). Our gusseted wheel center is 29% lighter than a similar 3/8 center, and is 23% stronger. You can see from the red in the gussets that they are carrying the bending load in this simulation. Normally that stress would be in the flat center, and it would bend it! 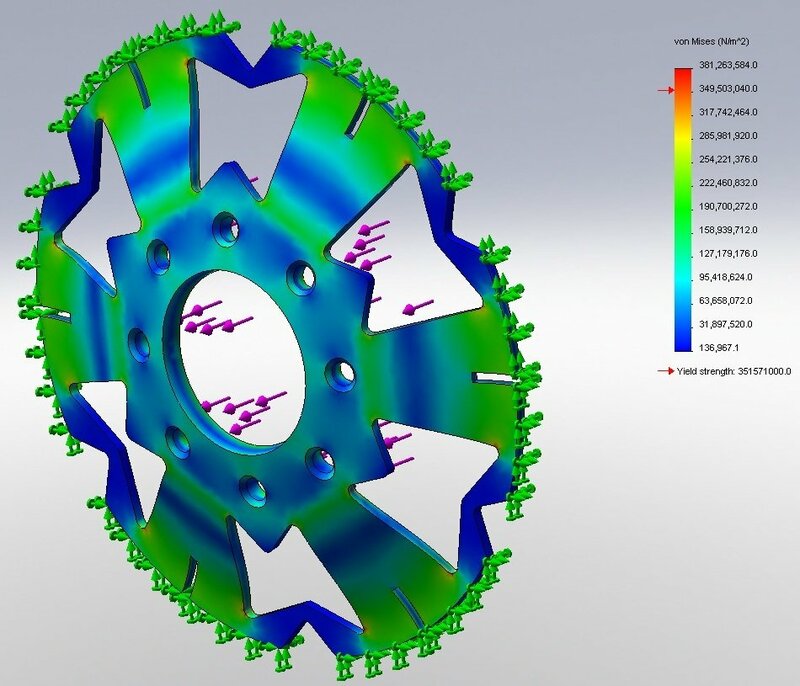 All of these simulations were run in solidworks 2010 using the same material. Weldments were modeled as .050″ radius fillets. In real life, weldments are much larger than this, but it is common practace in FEA to limit load bearing material contributions in weldments to better represent the negative material conditions caused by the heat affected zone (HAZ). This test approximated the loading zone of an axle hub and assumes the diameter of the wheel does not change (deflect) during the test. The deflection of the centers in these pictures is exaggerated. I have my simulations configured to exaggerate the deflection because it is helpful when determining if the loads and fixtures are applied correctly. In real life a 3500 pound load would not cause noticable change in the shape of either of the centers pictured above.